Started Aug-24-01 09:42:58 DPT mail this auction to a friend! Update item Seller: If this item has received no bids, you may revise it. 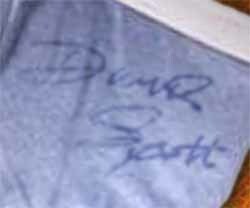 Very rare David Scott signed and worn Underwear. Autographed by David Scott in blue marker. These signed Briefs (size Medium) come with COA (Certificate of Authenticity) from FFG Inc., an official GCBA Member, and full lifetime authenticity money back guarantee. Signatures are obtained in person! Great & Rare gift idea, investment and conversation piece for the collector ! The underwear are in perfect condition and look almost brand new. Looks great in your Livingroom, Bar, Hobby Room, Office, Shop, etc. This underwear has been collected in 1991 in Miami and have been kept in excellent condition since. These briefs have never been washed since Mega Pop Star David Scott has last worn them. Please make payment by money order, cashiers check and all major credit cards. If you prefer personal check, delivery will be made the day after the check clears. All our items come with a full money back guarantee on authenticity and 100% satisfaction. Bid with confidence we have a PERFECT feedback record. We're number 1! Thank you for your interest, and please check out our other auctions, there is much more! NO RESERVE PRICE - GOOD LUCK ON THIS DEAL!! We will bid incrementally on your behalf up to your maximum bid , which is kept secret from other users. The term for this is proxy bidding . Buy It Now ends this listing. This option disappears once a bid is placed.